Large Capacity Stainless Steel Trash Drawer - Free Shipping Nationwide! Why ruin your outdoor décor with unsightly trash cans? The 18” Double Trash Drawer by Twin Eagles provides a spot for you to hide away two trash containers! 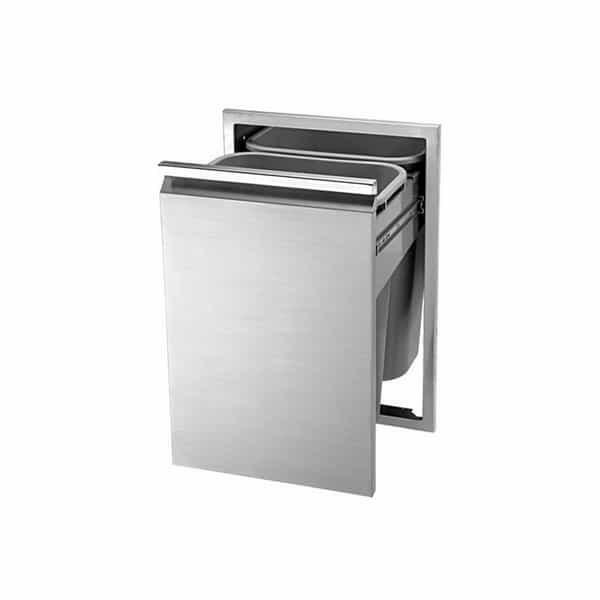 This drawer will hold up to 100 pounds of trash behind an attractive 304 stainless steel double-walled drawer. A flush handle and highly-polished accents give this convenient unit a lustrous appeal. The 18” Double Trash Drawer comes complete with two trash containers; use one for recycling! It is easy to install with the included 18 gauge front frame, which will allow you to achieve a precise alignment.